Linking up with Fine Linens and Purple today for What I Wore Sunday - a link-up I always think to do but never get around to getting the pictures! 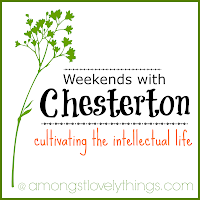 Also, sharing some Chesterton goodness on skirts and dignity for Sarah's Weekends with Chesterton link-up. Haha, every weekend Chesterton wins me over again and again! His gift for words are just magic! I was able to snap a shot of what I wore today for Mass with my iPhone (not the fancy cam yet, as it just finished charging hours ago), and decided I would seek out some Chesterton words on women's clothing. Off I went to Google Search and entered "Chesterton" and "Women's clothing" and this tidbit of fun came up. It made me smile. It made me happy. It made me think of the months last year that I decided I would wear skirts and/or dresses everyday for as long as I could. I was intentional and diligent up until October came around and life around here started getting cold. Being a Southern Texas girl who now lives in North Texas, my wardrobe isn't very lending. Even though I've been here for four years now, I haven't expanded my winter wear as much as I'd like. All this to say, I didn't know how to make skirts and dresses work when it started getting cold! At the end of it all, I have to say, wearing dresses everyday was wonderful! I felt beautiful. I felt feminine in a more intentional way. Obviously, I am naturally feminine because I am a woman but the flow and twirl, the gentleness and softness were just lovely! It was fun and easy too! My boys love to play hard all day and wearing the long dresses or skirts was more fluid than I anticipated for our daily fun. I honestly have yet to really unpack all that being more intentional in my beautiful gift of femininity that God has blessed me with, but I do know that Chesterton was onto something when he said that the skirt means female dignity (Just think of all the wonderful Theology of the Body correlations this quote has!!). Unfortunately, as temperatures decreased my wardrobe that could support this endeavor did too. I threw in the towel and started wearing my jeans and pants again along with skirts when I could manage it. I think they all have their place, but I will say that it was a special time when I was "skirting up" (as Feminine Genius, Inc. likes to call it) and fun! Not sure if or when I'll skirt up again, but for now I'll keep on keeping on skirting up for Mass. 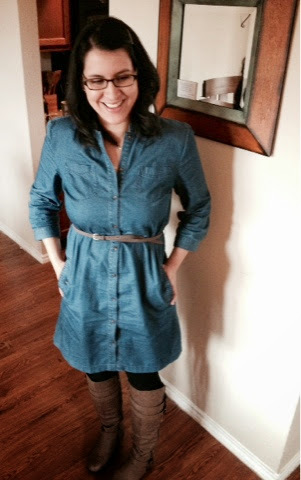 Here below is what I wore today (Sorry about the blur!). Thanks for stopping by and look forward to seeing more on Chesterton and what everyone else wore! Love that whole look! The dress is totally cute! !